Mike and Rachel, you work as a team to write fantasy novels. Congratulations on the release of your second book, Jala’s Mask, which was released last November! How do you see your work fitting into the contemporary publishing market? Rachel: Thank you! 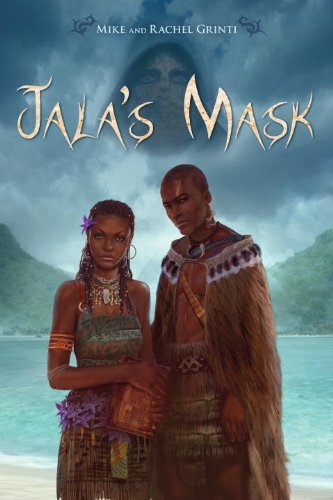 We’re really excited that Jala’s Mask is out in the world now. But you know, I try not to worry about the market. I’m certainly aware of it. It’s my job to be aware of it as a writer and a librarian. But I try to focus on writing the books I would have loved if I were a kid today–and the books kids need today. The We Need Diverse Books movement is growing, getting more attention and support, which is so great. We need more books starring characters from underrepresented groups of all kinds. I hope we see the market shift in that direction, and I hope my work will contribute to that in some small way. It’s so important for kids and teens to see themselves represented in books. I know in my case it took me far too long to sort out that I liked girls along with boys. I identified with and imagined myself as so many characters from books, and I spent countless hours as a kid daydreaming and imagining new stories with myself as favorite characters, but there wasn’t anyone asking that question. On TV there was Buffy, Xena, and Sailor Moon, but I was a reader first. (And acquiring Sailor Moon meant mailing off money orders in exchange for fansubs copied to VHS, so it wasn’t exactly easily accessible.) Books can have a huge impact on kids, and all kids should be able to see themselves in the stories they love. There’s plenty of room in the publishing market for queer girls of color learning magic or disabled girls flying space ships, and those are the books I want to write (and to read, support, and purchase for my library’s collection). Mike: I don’t know that I can really put it any better than that. All of those things. I want to write books I’m proud of, the kinds of books I would have loved, books that let all sorts of different kids see themselves having magical adventures. I think trying to write stories with diverse characters and places has had a profound effect on the way I approach fantasy. Fantasy is a genre that has a tendency to sway towards either broad, sweeping strokes of worldbuilding or a kind of very analytical, logic-based approach. But broad strokes can tend to create monocultures–“these people act like x while those people act like y,” etc. Even worse, the broader the stroke the more it tends to unquestioningly take on all sorts of assumptions about race, gender, sexuality, etc. At the same time, building culture from logic creates its own problems, because humanity and culture are illogical. It’s an interesting challenge. We want to create wondrous alien worlds, and at the same time we want it to feel real and grounded and we don’t want to exoticise. But when you think about it, we all feel alienated by our situation, and are sometimes overcome with wonder at the everyday of our lives. It’s a very people-focused approach to worldbuilding, I guess. And I want to try and cram this into fast, funny adventures… because that’s the kind of thing I needed as a kid trying to escape, and it’s the kind of thing I need now. I certainly feel like I’m very much in conversation with the fantasy I’ve been reading all my life. Hopefully there’s a place for it in the market. I think the audience is there. Mike, can you talk about your pre-Odyssey writing process, and what made you decide to attend the Odyssey Writing Workshop? Mike: Pre-Odyssey I mostly floundered about, trying on different styles and voices and story-types, trying to figure out who I wanted to be as a writer without knowing that’s what I was doing. I think from the beginning I’d had the sense that there was a limitless amount of stuff to learn, and I was pretty set on learning as much as I could. At this point I’d only been writing for about two years. So there’s really nothing you’d want to call “process” going on here other than a stubborn, obsessive desire to try and do this writing thing if I could. I tried to write every day, and if I didn’t I felt bad about myself. That’s it–that was the process. And I’ve had to try and unlearn a lot of bad habits from those days, too–writing every day is not the answer to everything! Sometimes it’s a really good idea to NOT write and let something set for a day or a week. But I think at the time it was the only thing I had to latch on to–as long as I was writing something, I must be making progress. I’d just gone off to university, and immediately set about taking writing classes, exchanging work with other writerly types. Nancy Jane More, a much more experienced writer I was lucky enough to befriend, was a Clarion grad. She pointed me first to Alpha, a writing workshop for teens, and then to Clarion and Odyssey as options. I’d already been submitting, and managed one or two semi-pro sales. Alpha had been a wonderful experience. It only seemed to make sense to go to one of the big professional workshops. I chose Odyssey because I knew and liked some of the guests that year, and it catered to novels–by then I was already mired in the beginnings of a first novel, and knew I wanted to work in longer forms. How do you feel your writing and writing process changed as a result of having attended Odyssey? What insights did you gain into your own work? Rachel, can you tell us what drew you to writing? Mike: The thing I’ve always said about Odyssey is that it didn’t so much teach me how to write–it taught me how to learn. I’m sure I came out of it improved as a writer, but the thing to remember is that it takes time to process all this information. Years later I was still pondering suggestions I’d gotten and seeing them in a new light. (My Odyssey-mates who said Death shouldn’t speak in my story? Yeah, you were right.) And I still think about critiques I gave, thinking I knew everything, and I cringe. So it’s hard to draw a clear line from my writing to Odyssey except to say that, like any deluge of information, it pushed me as a writer. But I can say for certain that it prepared me for the next several years as a writer. Having to give and take feedback, having to approach writing analytically, having to try things people recommended to see if they worked, having to try and constantly process all the information to create an internalized understanding of the craft… that’s what you’re doing there. You’re learning how to think about writing despite all the anxieties and self-defense mechanisms your brain tries to build up. It’s why a lot of people feel these kind of intense experiences help break them out of plateaus in their writing. When I went to Odyssey, I thought that was the most intense writing experience I was going to have. After that, I worked one-on-one with an amazingly generous writer at my university, Laura Lauth Schneck, and I thought that was the most intense writing experience I would have. Neither of them compares to getting full-blast, no-sugarcoating feedback from Rachel. There’s no single thing you can do that makes you a good writer. But anything you do that pushes you, makes you think about your writing in a new way, makes you examine your craft from a new angle–all of that is a stepping stone to getting better. And maybe along the way you’ll write some cool books. Rachel: I learned to read very early, and I started making up stories, too, writing them down as soon as I learned how. I’ve always wanted to be involved in books, but for a long time I didn’t think it would be on the writer side. I liked editing and still do, so for a while I thought that might be my career path. Looking back, I think I needed some time to read and absorb more stories, but also more confidence. I bought into the advice to start with short stories and it just never went anywhere. I didn’t enjoy reading them as much, I didn’t have short story ideas, and I really loved novels. I’d given up on writing almost entirely, or so I thought. I took a young adult literature class in college, and instead of an essay, we could write a few chapters of a young adult novel. Sounded great to me–turns out it was super difficult, the chapters were terrible, and I threw out that idea later. Still, the thought of writing novels had become a real possibility. I accepted my lack of interest in writing short stories and let myself think about novels. So, for anyone who just can’t get into short stories, don’t be scared to jump right in and try a novel. There’s nothing to lose. Even the chapters and ideas I threw out were important parts of my learning process. 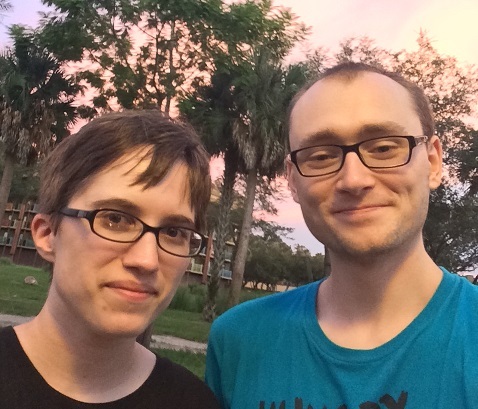 You and Rachel have been writing together for quite a few years. How do you feel this has strengthened your writing? But, there are at least a few large shifts in my writing I can identify that were directly affected by Rachel. Probably the biggest is that our focus on diversity and representation started with Rachel. She’s the one who kept up on the discussions; she’s the one who pointed me to important blog posts and forum threads; she’s the one who called me out on things I was doing or wasn’t doing. I’ve done a lot of work on my own understanding these issues and trying to understand how it should affect my writing, but Rach started me down that road and has been a huge part of helping me figure it all out. Trying to write diverse books has made me think in new and critical ways about the way I build worlds. It’s given me tools to help me identify when I’m taking the lazy road with characters and dialog so that I can dig deeper to create something more real. I’ll always be eternally in debt to Rachel for setting me on this path (and of course to everyone out there who blogged and tweeted and wrote books–I just hope our fantasy adventure novels are even a little bit worthy of all that hard, sometimes dangerous work). Besides that, I know that there are things that I didn’t start thinking about in a real way until Rachel brought them up. Character voice, certainly, which isn’t just the way a character speaks in dialog, but the way they fill a scene, the way they act and react. Thinking about plot in terms of character arcs is something she first started really pushing us on. She’s never precious with her writing, and is always willing to throw things about if they aren’t working–my natural tendency is the opposite, so it’s been huge that I’ve gotten more and more comfortable with seeing rewriting not as a failure but as part of the natural process. There’s more. I could probably talk forever about the things Rach has done for my writing. But after a certain point, trying to separate out who does what becomes a little silly. There’s very little I would identify as “my writing” as something separate from “our writing.” Our writing is an ongoing conversation, a collaborative growth that’s greater than what either of us could do on their own. Basically, I’m saying our writing is like a Crystal Gem fusion, and if don’t know what that means you’re not watching Steven Universe and you should be. How do the two of you split the job of writing? Do you tend to write everything together, or do you alternate chapters, or alternate drafts, or have one person outline and the other write, or each take charge of particular characters? Has your process evolved as you’ve been working together? Do you have any advice for those who might be starting out as co-authors? Rachel: It’s an evolving process. We started out trying to alternate chapters, but it turns out that doesn’t work well for us–someone inevitably got impatient if it wasn’t his or her turn yet. Our current method is much less structured. We have book meetings to talk about outlines and plots and to discuss characters. I do more of the rewriting, but sometimes I’ll leave a note saying “rewrite this scene” and trust it will get done. That frees up my brain to focus on another section of the book. To write with a partner, you should have great communication, a lot of trust, and the ability to give up some of the control you might be used to. In exchange, you get to have a teammate in a career that is often very solitary. Someone equally invested in the project from the start. You can bounce ideas off them, whine about the difficult parts (and tag them in to help if you’re really stuck), and tackle multiple parts of the book at once. It’s not for everyone, but it’s working for us so far. Other writing teams may prefer to be surprised by plot and character developments as they pass the manuscript back and forth. I don’t think any method is better than the others, but it can be frustrating if you work in very different ways. So I guess the last bit of advice is to be flexible. Mike: Sometimes we’ll work in the same file using Google Docs, at the same time. As I’m writing I can see Rachel’s cursor bouncing around, rewriting things. We like to tell other writers that because it freaks them out. But really, I know that the writing is getting better, and I haven’t had to do any of that work! Amazing! I think it’s easy as a writer to feel like you have to have that control, but it’s such a double-edged sword. For myself, I’ve learned the hard way that when I have too much control, it’s very easy for my writing to become extremely self-indulgent. Having a partner means that I always get called out for my bad writing and I can’t ever use the excuse that I just like it that way–either we both like it, or it’s not going into the book. So I really embrace having to answer to someone else as something that pushes me as a writer. Of course, it helps that I think Rachel’s writer-brain is absolutely brilliant. She’s always figuring out new things about our craft, and I’m just playing catch-up trying to take it all in. Really, for any kind of professional relationship–writing partner, editorial–I think the important question to ask yourself is “when I listen to this person, do I like the writing and story that comes out more than what I came up with on my own?” So when you get writing advice, try to understand it, then try to act on it, and just see what comes out. Maybe it won’t be better. But maybe it will. Either way you’ll probably learn a lot. Fun fact: Rach is at this very moment making fun of me for how bad my spelling has been in this interview. If you had to read me unedited it would be full of exclamation marks and emoji and most words would be misspelled. 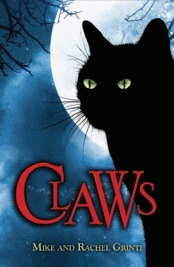 Your novels Jala’s Mask and Claws are geared toward younger audiences. What drew you to write for young adults and middle grade readers? What are some challenges unique to writing for a younger audience? Mike: I fell into it by accident. Lots of adult fantasy features young characters, and that’s how my first book was. Rach was the one who said it felt like a book for kids. Eventually I agreed, and found I loved writing in that space. There’s so much freedom to both be serious and ridiculous–the variance in tone is just wonderful. When you can have rich fantasy and moving emotions and still have kids talking about farts… you just can’t beat that. The thing that’s great about young readers is that it’s all new to them. They haven’t read my influences yet, they’re not jaded science fiction/fantasy readers. You can be someone’s first ever Favorite Book of All Time! (Or at least, until next week when they read a new favorite book.) How incredible is that? The book that made them love reading, the book that made them want to read every other book in the science fiction/fantasy section. Books they’ll remember decades later. It’s just too cool. Besides, fan mail from kids is the best. Rachel: I’ve always read a lot of middle grade and young adult fiction, and I work as a children’s librarian. It was a natural fit, and I love writing for younger audiences. We’ve gotten amazing letters and drawings from our readers, and it feels really cool to know one of our books could be the one that gets a kid into reading or that a teen reader really resonates with. There are definitely some things about writing for kids that are unique to that audience. I’m focusing on middle grade here because there are more limitations–no swearing, or very minimal swearing, romance is very light (first crush and hand-holding level), and fantasy violence is often more acceptable than violence that could happen in real life. The “what to do with the parents” problem is common–how to get the adults out of the way so the kids can have adventures–but there are plenty of ways around that. Parents are extremely present in the lives of most 8-12 year olds, but there are tons of problems parents can’t solve for their kids. Sometimes parents make things worse. In 6th grade I told my dad about a bully who’d stabbed me with a pencil and his advice was to talk to her and invite her to a movie. But the main things are don’t talk down to kids, treat them like the smart readers they are, and write the kind of stories you want to read. Thanks for reading! Watch for Part Two next Sunday, in which the Grintis discuss sales, rejections, and what’s next for them.